This reconstructed family house from year 1925 represents a visible tendency towards the preservation of tradition and affinity for the demands of modern lifestyle. 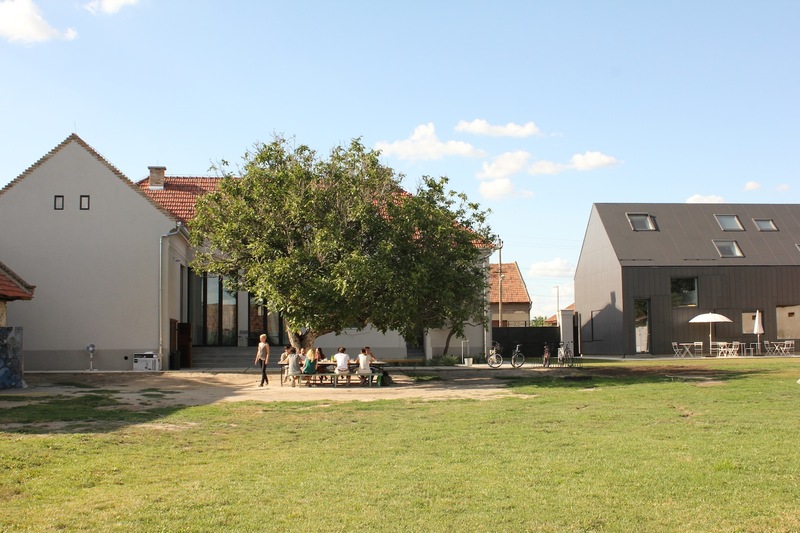 House A is primarily a guest house, an inspiring meeting place for professionals in the field of art education, design, agriculture, literature, business and innovation. The soothing atmosphere, bathed in light tones interior offers an inspiring space to relax, socialize and create. A typical north Serbian broad staircase with a porch welcomes you and a gives a broad view of the vast estate. Grand prize at the 33rd Salon of Architecture. 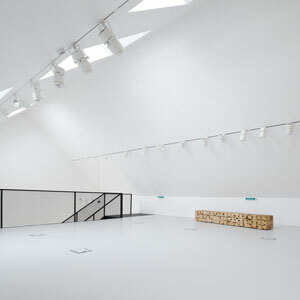 This facility, which has become a toponym for Mokrin, is a unique space for residency artist and lecturers. Ideal for creative work, lectures and workshops. The lower part of the house is equipped with a functional space for exhibiting and presentations. An open and modular form of the space emphasizes the creative interaction of people using the space. The relation towards the heritage is preserved through the geometry and structure of the building, which remains intact. 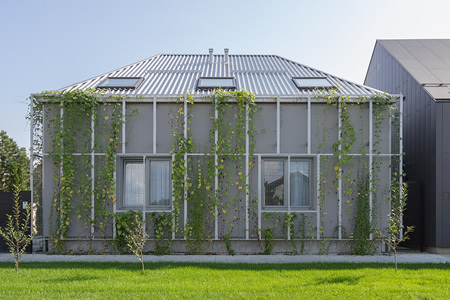 The street facade, with its position and the number of openings makes this house a modern interpretation of the authentic, traditional houses in Vojvodina. 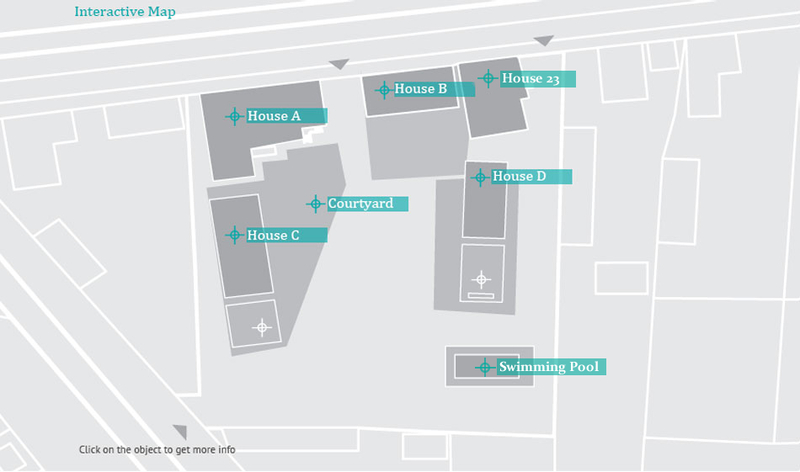 A spacious courtyard that connects all of the buildings on Terra Panonica property offers many amenities. Under the canopy of a walnut tree, which forms the centerpiece of the estate, which is a perfect place for spontaneous meetings and discussions around a table, as well as informal meetings and socialization. It is always a good place too try the famous homemade rakija , as well as Mokrin cheese and homemade strudels. The rest of the yard is perfect for enjoying all kinds of recreational activities, Frisbee, badminton and sunbathing, but also for organizing various events: concerts, theater productions and film programs. 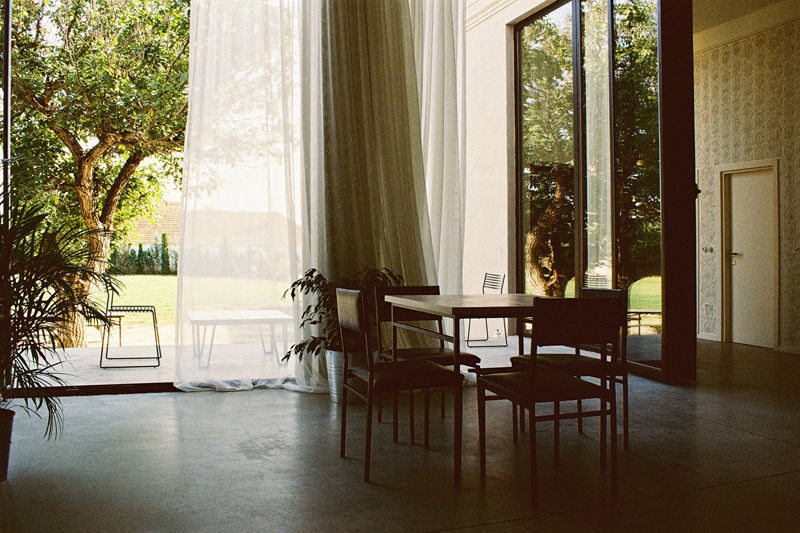 House C represents an experience point - a meeting place for all – the artists residing and creating on the estate, as well as for leisure visitors and those on vacation. It is conceived as an entirely open multifunctional space for the most diverse events: presentations, film screenings, concerts, exhibitions, food tasting etc. 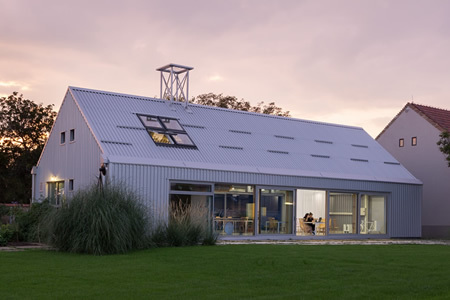 Mobile interior partitions, rotating work station and large openings on the façade - connecting the interior with an outdoor plateau and the vegetable garden garden, make the House C very adaptable for various activities. Depending on the position of the rotating work station as well as whether the screen of the kitchen alcove is open or closed, the visual impression of the interior fluctuates from the warm feel of a dining room or a cafeteria, to the cold ambience of the stark exhibition hall. The interior is equipped and shaped for most diverse events (from presentations, exhibitions, concerts, food tasting, to the cafeteria and places for relaxation and leisure); it is designed to evoke local outdoor sheds and canopies covering parts of the household, alowing intense contact of interior end exterior and a comprehensive experience of the local context and environment. House D is a universal workshop designed for different types of creative work. 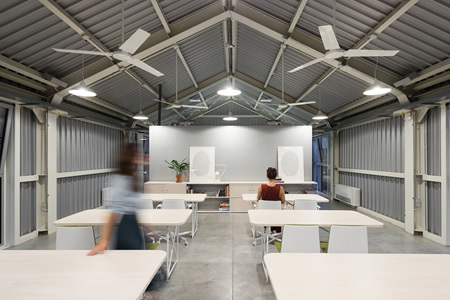 It is a contemporary craft workshop for artists, designers, developers and researchers, conceived as an integrated two-level flowing open space. Ground floor is designed as an integrated space for manual work with such materials as ceramics, wood and metal, while the upper floor is intended for computer work, conferences and meetings. Both an integral part of the building and its outdoor extension is the light steel structure on columns with a separate staircase - which forms a terrace and represents an exterior work space on ground floor and the upper floor, so that the capacity of the workshop is significantly expanded during summer period. 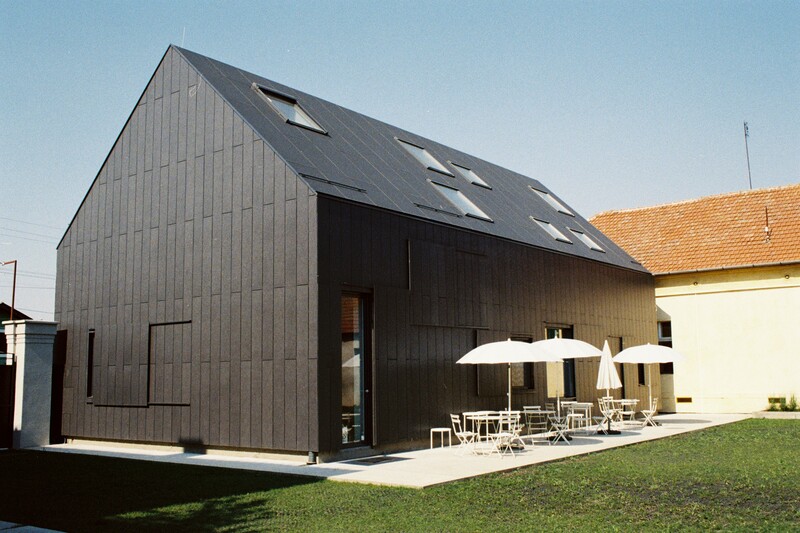 The geometry of the House D is derived from the corn shed that was once located in its place, as well as the prefabricated utility structure of a neighboring household in its immediate environment. The building is materialized in stark simplified form, "rased on its feet," and lifted off the ground, with the idea that it only overhangs the part of the estate. House 23 is the main accomodation object on the estate. Once a cosy familly home this object has been transformed to accomodation object that can house 24 people. On the upper floor there are 6 double rooms, each with its own bathroom. On the lower floor there is a small kitchen, lounge area and 2 6-person room, each with its own bathroom.